Florence and Pisa is a popular Shore Excursion from Livorno that you will enjoy as you journey into the heart of Tuscany to visit Pisa and Florence in the comfort of your own private deluxe vehicle driven by your personal Rome Cabs knowledgeable English speaking Driver eager to help you create memories that last a lifetime. From the Leaning Tower of Pisa to Ponte Vecchio in Florence, Rome Cabs combined Tuscany’s top two destinations into one exciting excursion. Shore Excursion from Livorno Port of Call: Your Rome Cabs professional Driver will pick you up at the pier next to your ship at 8:00 AM, and bring you back at 5:00 PM. * The itinerary and price of this tour are created only for shore excursions that start/end at the Port of Livorno. * Shore Excursions starting from LA SPEZIA Cruise Port are 100 EUROS EXTRA. Following a pleasant drive through the Tuscan countryside, you will arrive at your first destination, Pisa. Pisa is more than just one of Italy’s most iconic cities famous of the “Leaning Tower of Pisa” and top tourist destination, it’s also rich in history, architecture and culture. Its history goes so far back that ancient Romans referred to Pisa as “ancient”. Popular legend has it it was founded by the mythical king of Pylos after the fall of Troy. One of Italy’s four maritime republics, Pisa grew into dominating commercial center and a formidable rival of Genoa and Venice. It was during this time that Pisan-Romanesque architectural boom flourished and a millennium later still inspires awe in locals and visitors alike. In early 1400’s Pisa was conquered by Florence and fell under the influence of de Medici family who invigorated it with artistic, literary, and scientific ventures. Its reputation as a university town was reestablished during that time, with a certain Pisa born scientist who taught there: Galileo Galilei. Your fist stop in Psa will be Piazza dei Miracoli (Square of Miracles). This breathtaking square still continues to rival Pisa’s ancient nemesis, Venice. The square boasts its most significant architectural monuments, testament to its past wealth and power: the iconic “Leaning Tower”, the tilting bell tower next to the Cathedral, the Baptistery and Camposanto (Holy Field monumental cemetery). With its stunning beauty and impressive religious monuments, the square is not only recognized as one of the leading centers for medieval art, but was also declared a UNESCO Heritage Site in 1987. The 11th century Pisan-Romanesque style Duomo (cathedral) adorned with a facade of green and white bands of marble served as an inspiration for cathedrals throughout Tuscany. The stunningly overwhelming 12th century Baptistery dedicated to St John the Baptist is the largest baptistery in Italy! Behind the Duomo is the 12the century bell tower (or campanile in Italian) that became an international symbol. The tower stands at 183 feet tall, and it was designed to be furnished with seven bells cast to a musical scale. Better known for its nickname, The Leaning Tower of Pisa, leans 3.99 degrees (or nearly 13 feet) horizontally. Here you’ll also see the most popular photo op: standing “just so” with your arm extended in front of you propping up the leaning tower. Have fun being creative with your own photos in front of the tower! The tour continues with a pleasant drive through breathtaking valleys, soft rolling hills dotted with Tuscany’s signature cypress trees and ancient villas, to the Renaissance city of Florence. Italy’s cradle of Renaissance is also Tuscany’s treasure trove of the world’s most priceless works of art. The historical, cultural, artistic, and scientific impact of Florence is overwhelming, and its heritage unparalleled. There is a very special spot where you’ll have a splendid panoramic view of Florence....Piazzale Michelangelo. Here you get a picturesque view of Ponte Vecchio across the Arno River, the famous dome of the Duomo and Giotto’s Bell Tower, and the famous skyline of Florence that outlines its distinctive architecture. A short drive into the historic center will bring you to the Basilica of Santa Croce, where you’ll have the opportunity to see the impressive funerary monuments of some of Florence’s most illustrious: Michelangelo, Galileo Galilei, Lorenzo Ghiberti and Niccolo Machiavelli. Important artworks featured inside the basilica were created by great masters such as Giotto, Cimabue, Donatello, and Giorgio Vasari among many others. You will visit Piazza del Duomo where you have the opportunity to admire Florence’s dramatic Cathedral, Giotto’s Bell Tower, and the Baptestry - whose exteriors are decorated with polychrome horizontal strips of stunning green, white and pink marble. The cathedral (also called Basilica of Saint Mary of the Flower) is one of Italy’s largest churches, and until modern age its impressive dome was the largest in the world...as it stands, it’s still the largest brick dome to have ever been constructed. The trio are part of the UNESCO World Heritage Site. Nearby is the famous Old Bridge: Ponte Vecchio. With jewelbox gold shops, breathtaking views of the Arno River flanked by aged ochre and sienna buildings, Ponte Vecchio is quite a picturesque setting. 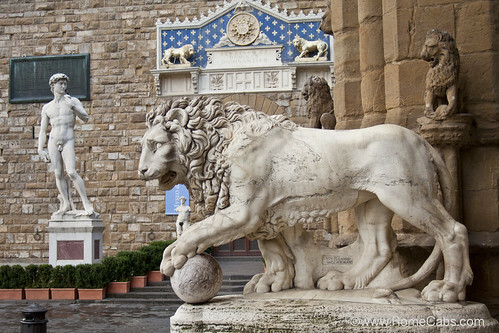 Piazza della Signoria features Palazzo Vecchio and the world renown replica of Michelangelo’s David statue. Here you will enjoy a Tuscan lunch at one of the many different restaurants in the piazza so you can enjoy the open air museum that surrounds you. On this tour you can enjoy a visit the Accademia Museum where you will have the opportunity to admire Michelangelo's real statue of David, along with many other exquisite works of art by renowned Italian masters. Thank you for choosing Rome Cabs Limousine Service for your tours, shore excursions and transfers. We look forward to meeting you and showing you our beautiful Italy! Guests who booked this Pisa and Florence Tour also enjoyed Orvieto in Umbria with Rome Cabs, and “Montepulciano and Pienza” ~ Wine and Cheese Tasting Tour in Tuscany, and the “Splendor of Ciociaria” ~ An Italian Countryside Experience via our sister company Stefano Rome Tours. * The itinerary and Price List of this tour are created only for shore excursions that start/end at the Port of Livorno. * Shore Excursions starting from LA SPEZIA Cruise Port are 100 EUROS EXTRA than the listed prices for Livorno due to greater distance and port fees. Please let us know if your ship docks at La Spezia Port so we can assist with placing your reservation and important information regarding tours from La Spezia. * The Tour Price includes your own personal English speaking Driver with a private deluxe vehicle, VAT tax, fuel cost, insurance, and all applicable toll and parking fees. * The Tour Price does not include entrance fees to museums, lunch, gratuities, licensed tour guides hired separately, or any other personal guest expenses. * If you are pleased with the service you received from your Driver, a minimum of 10-15% gratuity is customary in Italy. Payment for the tour will be made in Euro funds at the end of your journey directly to your Driver. You may pre-pay in advance via PayPal. Please let us know when you book the tour if you wish to pre-pay via PayPal. We do not accept credit card payments. According to Italian laws, Tour Drivers can not act as a tour guide and accompany guests inside churches, museums, monuments or squares to sightsee. If you prefer to have a licensed local tour guide accompany you to the museum or to sight see in Florence or Pisa, we can make arrangements for you as a courtesy service to our clients. Licensed Tour Guides are paid separately at the end of their tour service in Euro funds. * Please be aware that both Academia Museum and Uffizi Gallery are closed on Mondays, and on national holidays: January 1, May 1 and December 25. It is also NOT possible to visit Museums on 1st Sunday of Every Month as this is "free museum day" in Italy with NO advance tickets available and long wait lines to enter the museums. On these dates your museum visit will be substituted with other sites in Florence that best suit your interests and desires. It is not possible to visit both museum on a shore excursion. Accademia Gallery takes about 1 hour to visit. Uffizi Gallery takes about 2 hours to visit. To have more time to enjoy other sites in Florence, most of our clients book the Accademia Gallery. * Please wear comfortable shoes and clothing and mind your personal belongings while in public places and busy squares. Don’t worry, we will not ask you for your credit card information, require advance payments to reserve your tours, or penalize you with fees for cancellations. We operate on the traditional Honor System, so we kindly ask that any cancellations be made at least 7 days in advance so we can rebook your service and your reserved driver does not lose work for that day. We deeply appreciate your cooperation and consideration. Why is the Leaning Tower of Pisa leaning? The tower began to tilt even before it was completed! When it progressed to the 2nd level in 1178, the flawed foundation began to sink into the unstable subsoil. This halted construction for nearly a century to allow the underlying soil to settle and prevent complete toppling over. By 1319 the seventh floor was complete with the tower actually curved due to the tweaking. Fast forward 5 centuries to 1960’s, national concern grew over the possibility of the tower finally toppling over, so a multinational effort of a team comprised of engineers, mathematicians and historians gathered on the Azores islands to discuss stabilizing techniques. Apparently 2 decades of studies (and many espressos) did not produce a desirable solution and in 1990 the tower closed to the public. It took another decade of corrective reconstruction and stabilizing efforts to straighten the tower by 18 inches to its previous 19th century position. In 2008 after another restoration project, engineers where pleased to announced that for the first time in history the Leaning Tower of Pisa stopped leaning further down, and it’s been declared stable for at least another 2 centuries of of tourist visitations. Incidentally, efforts were never made to straighten the tower itself, otherwise it would lose its unique appeal. the port of Livorno to Pisa and Florence. us with a wealth of information about the area. at our hotels. Again, our tour guide Joe was amazing. again for a transfer from our hotel to FCO. Rome area without using Rome Cabs."